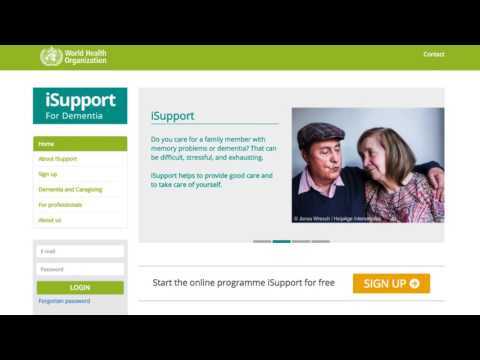 iSupport is an online training programme to support caregivers of people living with dementia. To adapt iSupport for your country, please contact us at whodementia@who.int. This version of iSupport is for field-testing and demonstration purposes only. Do you care for a family member with memory problems or dementia? That can be difficult, stressful, and exhausting. iSupport helps to provide good care and to take care of yourself. It is estimated that today, more than 47 million people around the world are having dementia. As a health professional, you are invited to refer caregivers to iSupport. iSupport is developed by the World Health Organization (WHO). Our goal is to build a better, healthier future for people all over the world. iSupport is an online training programme to help caregivers of people living with dementia provide good care and take care of themselves. If you are interested in iSupport and would like to make the programme available in your country, please contact us at whodementia@who.int. The version of iSupport is for field-testing and demonstration purposes only.